Sporty, sophisticated, and so sleek it could make a grown man cry–the cocoa colored wrist accessory that should make every watch enthusiast wish list is the irresistible Chocolate Daytona Rolex. 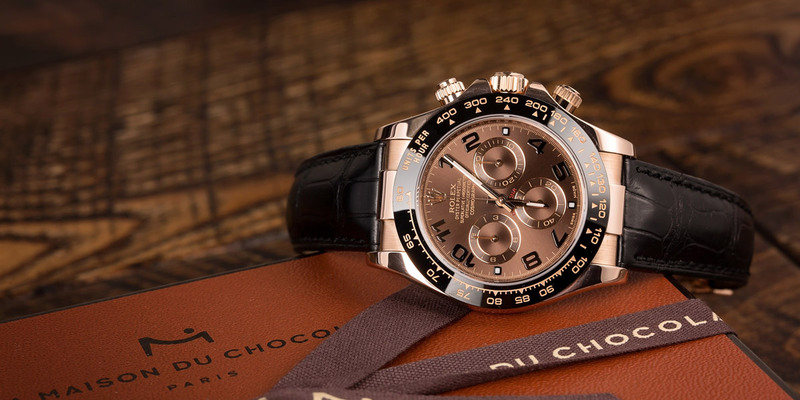 The Rolex Chocolate Daytona will look good on any wrist. The perfect accessory for a business professional or sport obsessed, this classic cosmograph is well suited to dress up a simple sport coat or add a hint of elegance to a casual jean and jacket combo. Stylish and timeless, the Chocolate Daytona 116515 was originally crafted for the fast and furious set; it was introduced in 1963 by Rolex and was designed to meet the demands of professional racing drivers. 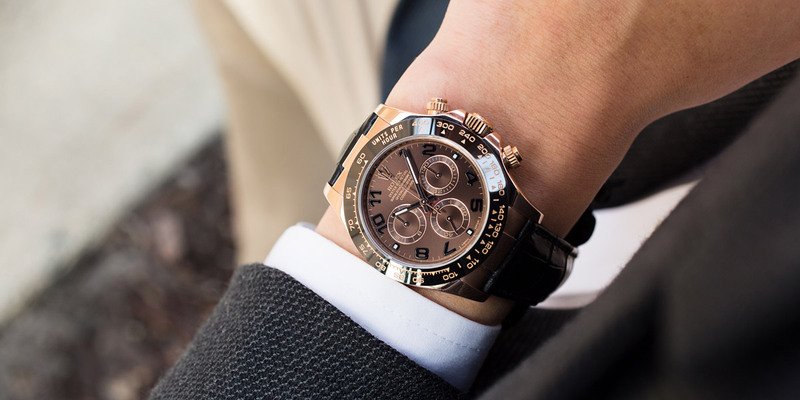 The Rolex Chocolate Daytona is a stunning watch for its rich colors. The Rolex Daytona ref. 116515 boasts impressive functionality and features. The metal used in its construction is an exclusive rose gold alloy that the brand claims will not fade or wear over time. And the noteworthy Cerachom ceramic bezel is resistant to any scratches or sun exposure; it’s the ideal accessory for travel or a few spins around the track. An alligator leather band showcases the tachymeter engraved black Cerachrom monobloc bezel, screw-down push buttons, chocolate brown dial and 18K Everose pink gold deployable fliplock clasp. Breathtaking in beauty and design, this popular model is a one of the most coveted models within the pricey Daytona category. 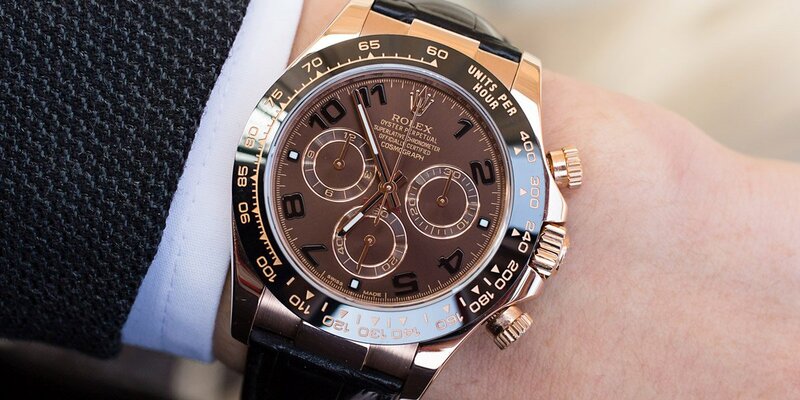 What are your thoughts on the Rolex Chocolate Daytona? Comment below? An unforgettable chocolate dial boasts Arabic numerals and a central sweep second hand that allow for precise and accurate readings of 1/8 second. The two counters display lapsed time in hours and minutes. To show off this statement making watch, opt for a houndstooth sports coat, with a simple lightweight sweater or crisp button-down. Polish off the look with a pair of classic dress pants or slim Dockers. The Chocolate Daytona is a dynamic and distinguished watch for speed seekers or just those in search of a thrill (race car not included).